June 20, 2017 June 5, 2017 Eric Mortensen 0 Comments 1972, Arxon, Fredric M. Kuriloff, Ideal, James R. Becker, Julius Cooper, MindMasters Inc, Sofronio H. Pasola Jr. Created in 1944, Stratego is probably one of the older board games still in production to this day. In Stratego you control an army of soldiers that you use to try and capture the other player’s flag. 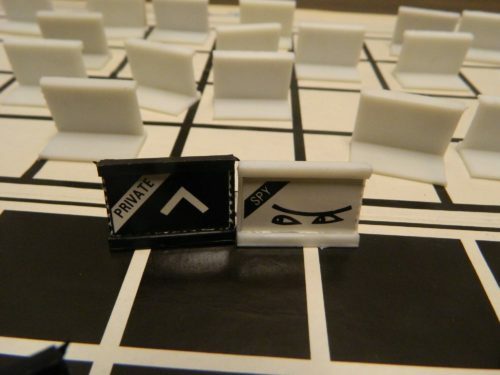 As the identities of all of the pieces are hidden until they get into a fight, you need to deduce the identities of the other player’s pieces to be able capture them and keep your own pieces safe. 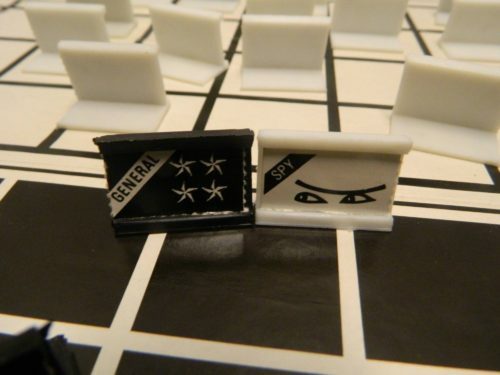 The reason I bring up Stratego is that today’s game Game of the Generals, also known as Salpakan or The Generals, takes a lot of inspiration from Stratego. Game of the Generals shares a lot in common with Stratego with a couple tweaks that both help and hurt the game. Place the gameboard in the middle of the table. Each player takes the set of pieces matching their side of the gameboard. 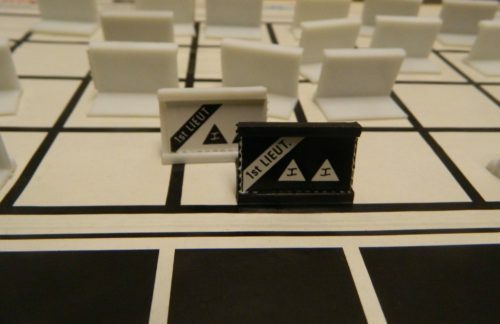 The players place their pieces in any order in the first three rows on their side of the board (with the text side facing them). After all of the pieces have been arranged there should be six empty spaces. The players choose who will move first. On a player’s turn they will move one of their pieces forward, backward, left or right. A piece cannot be moved onto a space where the player already has a piece. When a piece is moved onto a space occupied by an opponent’s piece, a battle will occur. In a battle you will compare the ranks of the two pieces to see which one wins the battle. In most cases the lower ranked piece will be removed from the board. 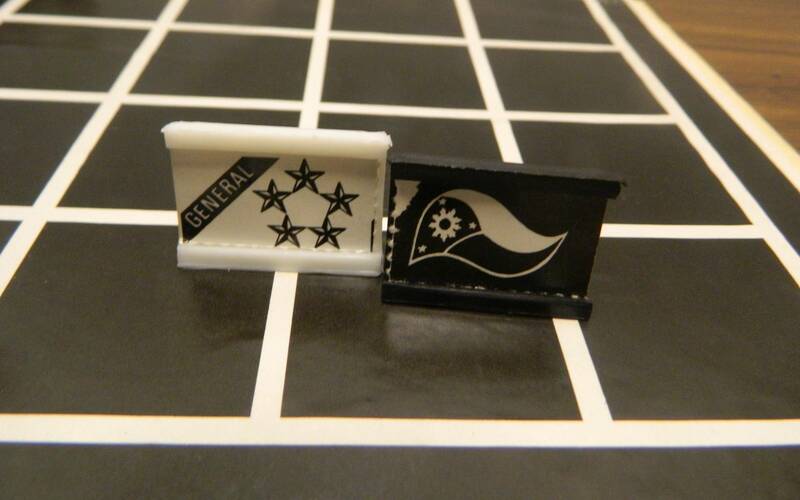 The five star general outranks the 1st Lieutenant which means the 1st Lieutenant will be removed from the board. If both pieces have the same rank, both pieces will be removed. These two pieces have the same rank so they will both be eliminated. There are a couple exceptions to higher ranked pieces beating lower ranked pieces. The spy will beat any piece ranked higher than a private. The spy will defeat the four star general. The private is the only piece that can beat the spy. The private will defeat the spy removing it from the board. The flag can be captured by any piece. The only piece a flag can capture is the other player’s flag. A player can win Game of the Generals in a couple different ways. One player captures the other player’s flag. The white player has captured the black player’s flag and has won the game. A player moves their flag to the other player’s side of the board. A player must reach the other side of the board in a spot where the other player can’t capture it on their next turn. 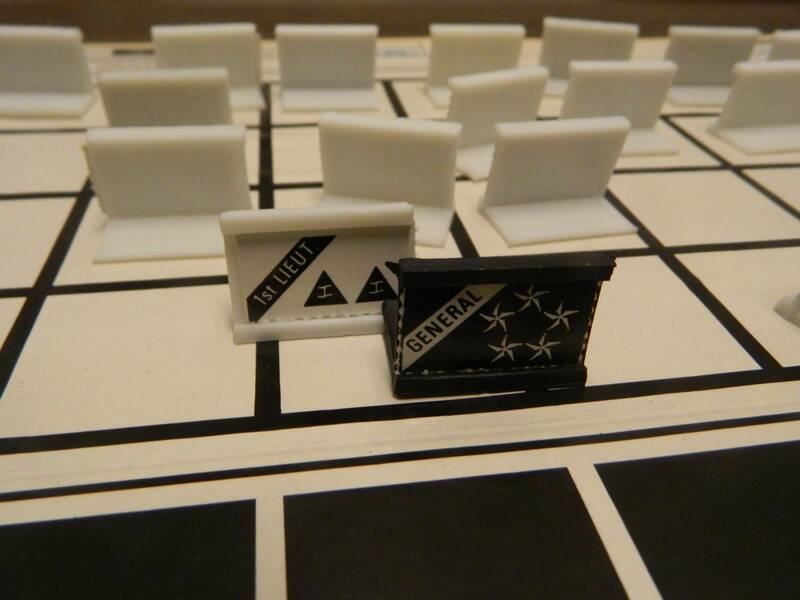 The black player has moved their flag to the other side of the board and has won the game. One of the players forfeit. Both players agree to a draw. As I have already mentioned Game of the Generals shares a lot in common with Stratego. There are so many similarities between the two games that I think it is easier to compare the differences than look at the similarities. Since most people have played Stratego before, I am not going to really talk about the mechanics that the two games share since most people probably already have an opinion on them. Basically I think Stratego is a solid family game that I would play every so often. The game deserves a lot of credit for creating interesting deduction mechanics but there have been better games released since Stratego came out. So instead of dwelling on Stratego lets look at where Game of the Generals differs from it. Probably the most significant difference between the two games is the fact that Game of the Generals utilizes an arbiter. 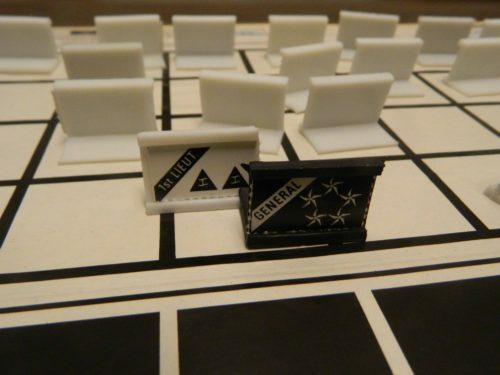 The arbiter is a third player or an electronic computer that compares the two pieces in a battle and tells the players which piece is eliminated. By utilizing an arbiter neither player will know the exact strength of the other player’s piece. I have to say that this is probably an improvement over Stratego. 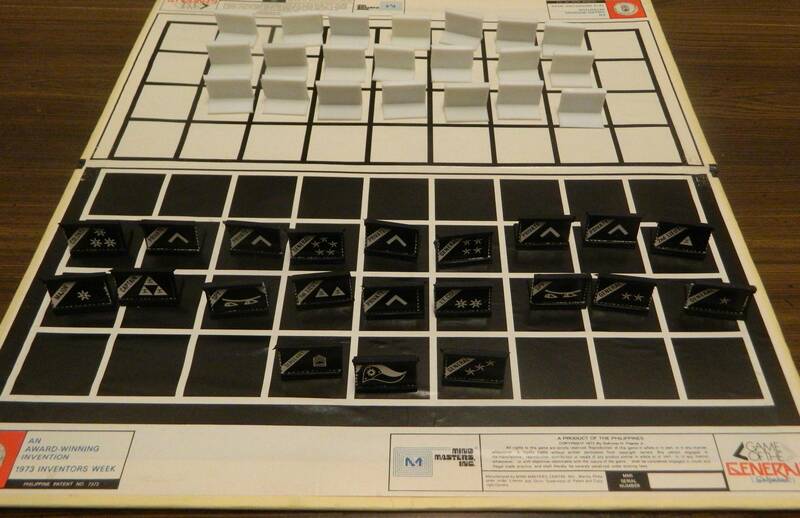 In Stratego you get to see the other player’s piece during a battle. You then know what the piece is and the game becomes more of a memory game as you try to remember your opponent’s pieces that have been revealed. If you never see the other other player’s pieces, you only have an idea of the strength of the other piece based on the outcome of the battle. This makes the deduction mechanic more important since you can never be sure of the strength of an opponent’s piece. At this point I want to point out that there are two versions of Game of the Generals. There is both an electronic and non-electronic version of the game. 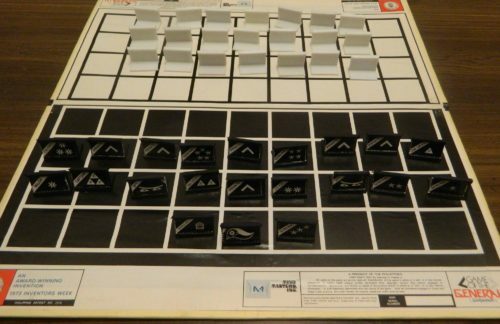 In the electronic version the game’s computer compares the strength of the two pieces. In the non-electronic version you need a third person whose only job is to compare the two pieces in battle and remove the less powerful piece. Of the two versions I ended up finding the non-electronic version. The main reason I can’t comment further on the arbiter mechanic is because I wasn’t able to use it. I just didn’t think it was worth it to force another person to sit there watching the game. This is why I would highly recommend the electronic version of the game if you can find it. 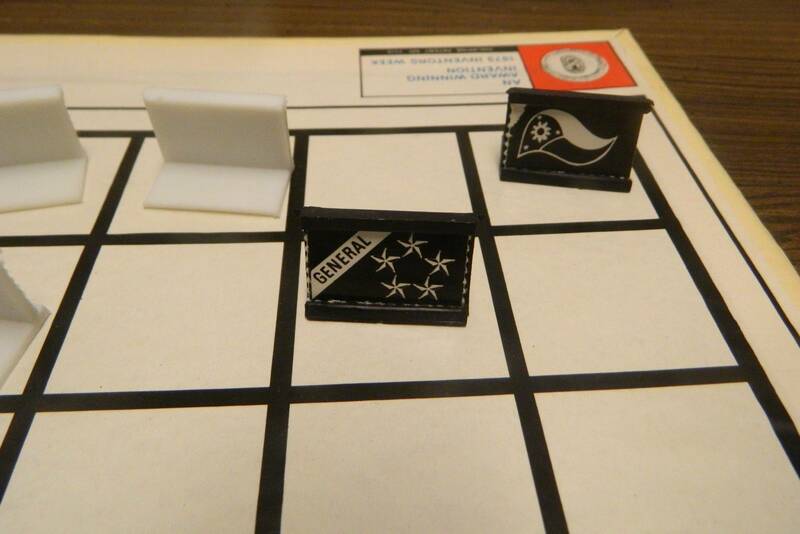 The second biggest difference between Stratego and Game of the Generals is the distribution of the pieces. 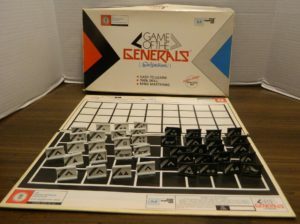 Game of the Generals has 21 pieces while Stratego has 30 or 40 pieces (depending on the version). Having less pieces impacts the game in a couple different ways. First most games of Game of the Generals should be shorter since there are less pieces that that can be captured which should make it easier to find the other player’s flag. Having fewer pieces on the board also adds flexibility when initially setting up your pieces. Stratego has you fill every space on your side of the board. With less pieces there is more maneuverability early in the game since a player has six empty spaces when they set up the board. The maneuverability is also helped by Game of the Generals eliminating the two lakes in the middle of the board. With less pieces the distribution of the pieces is also different. The distribution of some of the ranks have been reduced. The idea of miners and mines have been removed entirely from Game of the Generals. For the most part the abilities of the mine seem to have been given to the spy. The spy acts similar to the mine while also being able to move and not be destroyed when attacked. This makes the spy really powerful since it can eliminate every piece except for privates. I don’t particularly like this change since the spies are way too powerful as they can pretty easily mow through the opponent’s lines if they can avoid privates. I also have always liked the idea of the mines in Stratego since they do a good job of making a player cautious of being too aggressive. The last major difference between the two games is that the flag piece can actually move in Game of the Generals while it remains stationary in Stratego. I really like this rule since it is a simple rule to implement and it can significantly change the game. By being able to move your flag you have more flexibility. If your flag is in danger you can easily move it out of danger. Being able to move the flag also gives you another way to win the game. If you are able to get your flag to the other player’s side of the board, you automatically win the game. I always like when games give players more more ways to win the game. There is a risk/reward element as you could win the game but could also be handing victory to your opponent. I am intrigued by the potential strategy with this rule as you could try to sneak the flag to the other side or you could just try to muscle your way to the other side. With not a big difference Game of the Generals doesn’t utilize the numbering system used in Stratego. While there is debate between the English and British system of numbering pieces in Stratego, both systems make more sense than using no numbers at all. The ranks of the pieces in Game of the Generals are based on ranks in the military. If you know military ranks this will be no problem for you. If you aren’t familiar with military ranks though it becomes an issue. Until you remember the ranks you will have to keep referencing the instructions to see the order of the ranks. This doesn’t ruin the game but it would have just been easier to add numbers to the pieces to help people that don’t know military ranks. As I already mentioned there are two different versions of Game of the Generals/The Generals. Since I have only played the game with one version I can only comment on that version’s components. Without even seeing the electronic version though I guarantee that the components are better then those in the non-electronic version. The components for the non-electronic version are really bad. The gameboard and pieces are cheaply made. The components serve their purpose but are quite ugly to look at. While I think Game of the Generals has some nice additions to Stratego, I think Stratego is still the better game. I prefer the distribution of the pieces in Stratego as some pieces in Game of the Generals are way too powerful. The two things I prefer about Game of the Generals can be added pretty easily to normal Stratego. The flag rule is just a minor rule addition. The arbiter rule would either require another person taking on the role or purchasing Electronic Stratego (Amazon Link ). Should You Buy Game of the Generals? For the most part Game of the Generals is Stratego with a couple rule tweaks. I like the idea of never exactly knowing the strength of the other player’s pieces by using the arbiter. I also really like the idea of being able to move the flag and winning if you can get your flag to the other side of the board. I don’t really like the distribution of the pieces though. The spies are too powerful and I don’t like the elimination of the mines since they did a good job of keeping players cautious as they charge through enemy lines. Game of the Generals is an interesting game because I would actually give it two different ratings. The electronic version of the game is probably worthy of three stars. The non-electronic version only deserves two and a half stars though since you either can’t use the arbiter rules or a player has to sit around acting as the judge which is probably really boring. As far as recommendations if you don’t care for Stratego, you won’t like Game of the Generals. Of the two games I would probably slightly recommend Stratego. I think Stratego is a slightly better game and the best rules from Game of the Generals you could implement in Stratego. If you are looking for a different take on Stratego though it may be worth looking into Game of the Generals. Of the two versions of the game though I would highly recommend picking up the electronic version. The electronic version is pretty rare though and can be expensive. I would only recommend the non-electronic version if you can find it for cheap. Being able to move the flag piece adds quite a bit of flexibility to the game. The arbiter adds more deduction to the game. The spies are too powerful. The unit distribution is not as good as Stratego.